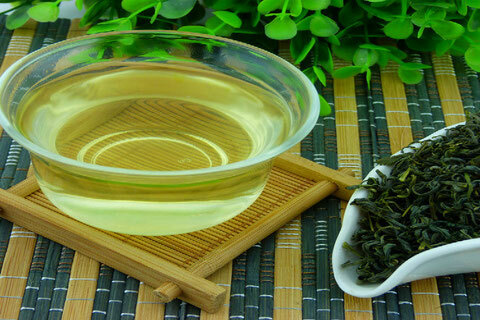 Song Yang Ying Hou Tea (Silver Monkey Paw Tea) is a green tea original from Song Yang county in ZheJiang province.Silver Monkey Paw tea is curly, more tips, like monkey claw, hence the named. 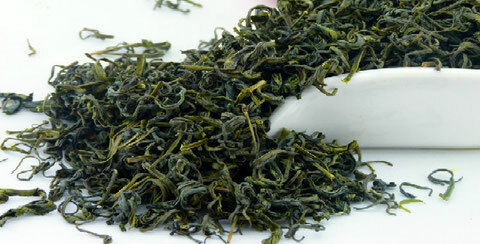 Silver Monkey tea is grown in the ancient city Songyang Ou River upstream area, where surrounded by hills, ridges winding, fog Piaomiao, streams criss-cross, mild climate, the average annual temperature is 17.7 ℃, frost-free period of 240 days, rainfall, 1511 mm annual rainfall, fertile soil, deep soil, rich in organic matter content, a unique ecological environment for the formation of silver monkey tea quality to provide a congenital condition. Technical sophistication of silver monkey tea plucking. Early mining, mining was tender, sorting net is silver characteristics of monkeys picking tea. 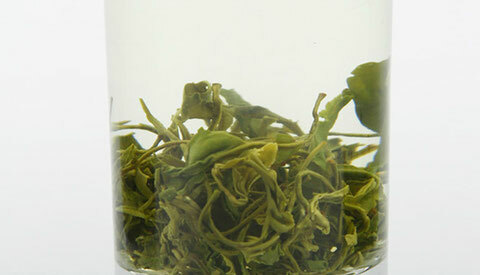 Mined before Qingming, when Guyu end picking criteria: grade tea for the early bud development; 1-2 grade tea for one and a bud to early development of two leaves and a bud. 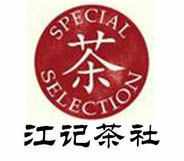 Typically, one kilogram of premium silver monkey frying tea, to be taken about 70,000 shoots. Collected debris back shoots should be removed to keep shoots complete uniform. Fresh leaves into the plant by 6-7 hours after the fresh leaves spreading, before frying. 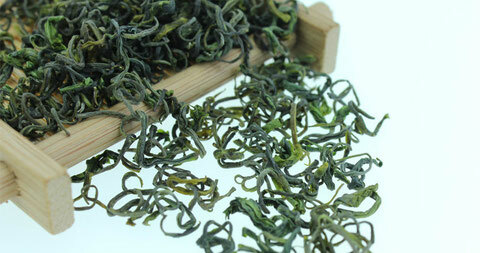 Separately frying process is mainly green, rolling, two blue, three green, drying and other five processes. Frying characteristics: high-temperature fixing, rub fried combination of slow light fried, while the whole side of fried, baked feet dry. Green is the first fixation: 69 cm in diameter of the ramp pan or pot within the far-infrared cookers. 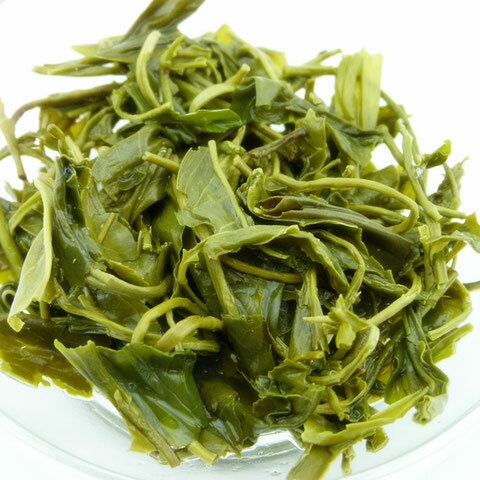 When the pot temperature reached about 150 ℃, investment share of 400-600 grams of leaf to throw the main speculation, combined with nausea fried, so that was thrown open, with a light, had dragged the net. To evaporate water, passive activity, even kill kill thoroughly exposed fragrance purposes. Lasted about 7 minutes. Rolling: The share of leaves of cool hand-crank after the light twist, rub a little profit to the tea, in strips over 95% is appropriate. When rubbing 2-4 minutes. Second Green: is the shape of the key processes. When the pot temperature 100-90 ℃, rolled into leaves, began to use rolling techniques, so that the cable more closely, and distributed part of the water, then lower the pot temperature to 70 ℃, the process of entry form, the whole form process using shaking, grasping, rub, winners of four techniques, while learning by doing fried form, shape of the cable tight end slightly curved shape, which lasted about 15 minutes, pot stand cool. Three Green: Green is the setting and put three cents processes. Flip through the slow light frying, on the basis of a fixed shape, to bend the cable to tight end, pekoe revealed, fry Bacheng dry, clean wok stand cool. Three young pot temperature 80-60 ℃. Lasted 15-20 minutes. Drying: the beginning of drying and sub-foot two baking process, initial drying temperature of about 75 ℃ bake, bake to Jiucheng dryness, bake 15-20 minutes, cool sharing, so that sufficient water distribution re-drying, temperature of 65-50 ℃ foot smelling , to the aroma of baking through the hair, hand twist that is broken, water content below 8% share from the bake cool boxing.